An expansive and simply divine scene of an archway with exotic palm trees and the beach beholds us in this tapestry. This palm tree tapestry is based on a work by artist Jill Schultz. The natural folds of a tapestry gives an illusion of movement that so suits this piece as the breeze of the ocean on this exotic place and the mystery of what this place has to offer is hinted at in this ingenious way. The grand sense of height in this archway suggests a place of grandeur. All manner of superb adventure could occur in a place such as this and this tapestry portrays this feeling exceedingly well. 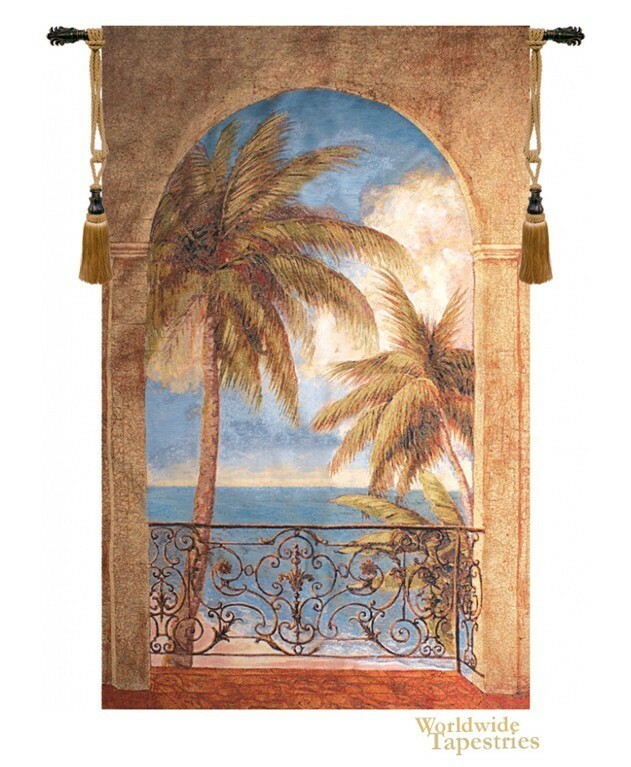 This tapestry "Palm Archway" is backed with lining and tunnel for easy hanging. Note: tapestry rod and tassels, where pictured, are purchased separately. Dimensions: W 50" x H 70"